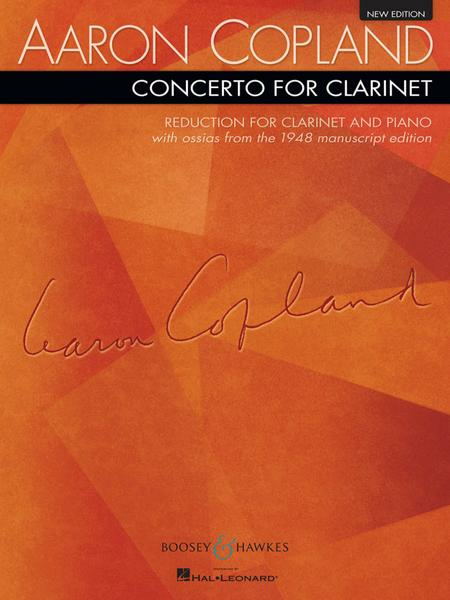 Reduction for clarinet and piano. Composed by Aaron Copland (1900-1990). Boosey & Hawkes Chamber Music. 20th Century. Set of performance parts (softcover). 27 pages. Boosey & Hawkes #M051580088. Published by Boosey & Hawkes (HL.48005879). Arranged for Clarinet and Piano by the Composer. May 28, 2011 My favorite concerto! requires nimble fingers, and throughout the rest of the piece there are different plays on rhythm and key signatures and note registers. There are also fun moments in the piece that suggest humor or jazz. This is a very good edition to purchase. It's what my clarinet professor suggests. particular arrangement is very good. 56 of 113 people found this review helpful. this is a good piece for dedicated Clarinetists. Good Luck! 53 of 108 people found this review helpful.